Most of the district is in San Diego County including Fallbrook, San Marcos, Valley Center, Ramona, Escondido, Santee, Lakeside, parts of El Cajon and mountain and desert areas stretching east to the Imperial County line. It extends slightly into southwestern Riverside County in the Temecula area. 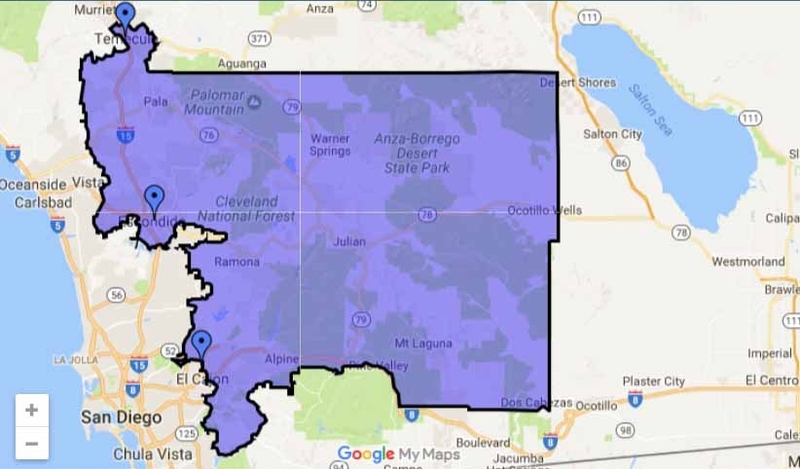 Republican Duncan Hunter inherited this seat from his father. Some would say he’s acted like he’s entitled to it. After being indicted for campaign finance felony violations, he initially tried to place the blame on his wife; has since walked that back some. The Marine Corps veteran has a reliably far-right voting record. Incumbency advantage within a reliably conservative district continues to give him the upper hand. Campaign finance abuse indictment will prove challenging, though it may not be enough in a historically Red district. Democrat, Small Business Owner (of ACN Strategies), Communications and Marketing Director of the U.S. Hispanic Chamber of Commerce; Public Affairs Officer for U.S. Department of Labor; Former Campaign Deputy Regional Field Director and White House official for Barack Obama's second term. Major backing by the Democratic party and its key officials. His campaign focus being “country over party” and not emphasizing Democratic alignment can appeal to independent voters to give him a boost. White House background is helpful.